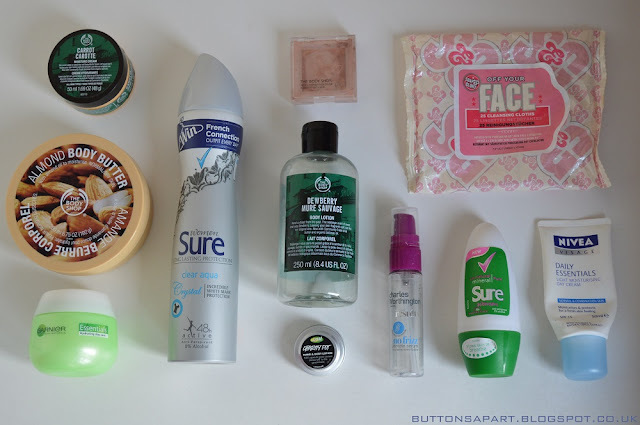 We've seen plenty of posts and video's on products people have used up and we've always found them interesting so we decided to share our empties! I'm a big fan of the body shop body butters and have tried many different flavours, during autumn/winter I prefer the nutty flavours and during spring/summer I prefer to go for the more fruit flavours. This butter is really moisturising and there are a variety of scents so I'm sure you can find one to suit your taste buds I would definitely repurchase this purchase. In fact I already have a sweet lemon flavour for the spring time. First of all this tin is really hard to open! In terms of the product the consistency is of a lotion as oppose to a body butter, it sinks into the skin quite quickly. Personally the smell of it is rather overpowering and I don't like it, it smells chocolatey but there are also some other undertones which I can't place. I think it's great thought that 100% of the proceeds are donated to charity. The carrot cream is great for adding moisture into your skin. It is advertised for all skin types and it works well with my dry sensitive skin as it has quite a thick consistency. Unfortunately the Body Shop have discontinued the carrot cream so am on the look out a new moisturiser. I'm not going to say to much about this product as I have already done a full product review on it which you can read here. I have been using this day cream since I was a teenager, and it's a product that I always keep back ups off. The product is light so it does not break me out, however it still moisturises my skin and keeps it hydrated. In addition I like that it had SPF 15 to protect my skin from the sun. This is my favourite deodorant. I have been using this product for years as it keeps me feeling fresh and does not leave any white marks on my clothing. I prefer to use make-up remover to remove my make-up so don't tend to use them for that purpose. I tend to use them when I'm feeling lazy to cleanse my face, or just to freshen up. They do the job and they don't dry out. These came in a Christmas gift set but I don't think I will purchase them as there are plenty of cheaper options that do the same job. I tend to prefer roll on deodorants to aerosols as they work better for my skin and are smaller so take up less room in my bag. The sure mineral roll on works well and I haven't been left with any white marks. It also contains 0% alcohol, which is a very important factor for me when choosing a deodorant. I feel like I have had this product for years! I bought it whilst I was at University because I had my John Frieda frizz ease serum but I wanted a second one so I could have one with me and one at home. This one happened to be on offer at boots when I went in so I ended up purchasing it. I have finally finished it. All the Charles Worthington products have been repackaged since I bought this, it worked okay for me but I think I prefer the John Frieda one over this one. This was palette no.02 in Bronze, it was also available in pink. I wouldn't repurchase this product as I felt it didn't show up well on my skin tone. I also found it difficult to open the case and the product breaks easily. What products have you used up this month? 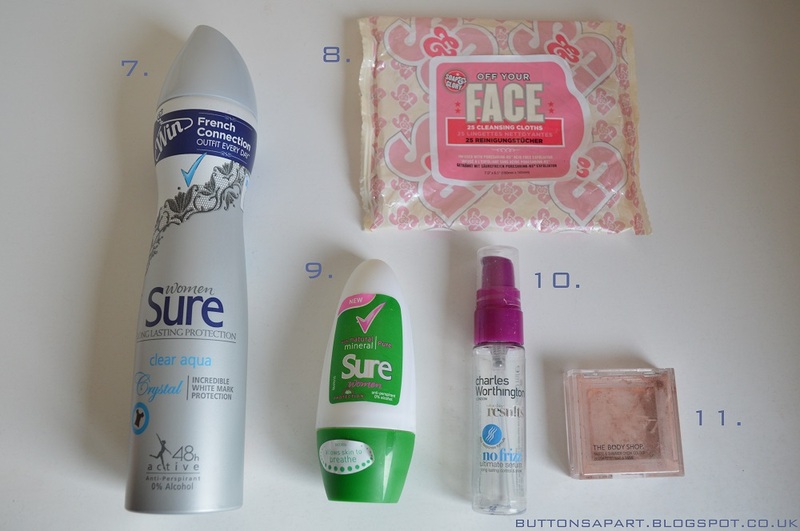 Really good blog, you are so good that you use products till the end! love all the body shop products! Various good skin care products. I like them. Welcome to share me on google+. We just got a Lush near my house, so I'm glad some of their products are included. I don't know where to start. Happy Monday! Hello, great blog you have. I’m your new follower. Would you like to follow each other? I love all body shopn things! This is a great idea for a post - too bad I have so much stuff that it takes me forever to get through anything!!!! 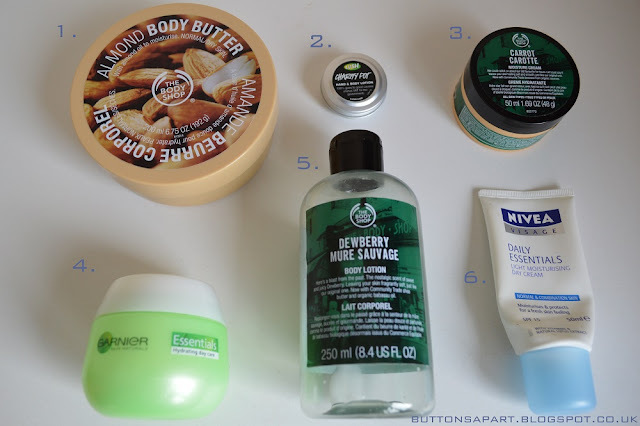 That almond body butter is a personal favourite. Whenever I'm in doubt, I always go back to it. love this products and also your blog! It's so nice!!! I follow you!